Here is a short explanation of all small icons which you can find on every coin page of the Numista catalog. The icons inform you about how far the information coin page has been accepted. What do the icons show us? The coin page is created but not verified - No information has been verified. On this page, any member can change any information. The coin page is partly verified - Only the years have been verified by the Numista team. To change any information about the years (add or remove) it's mandatory to make a request on the forum "Numista catalog" with a link to the concerned coin page. Only a team member can modify the list of the years. Any modification (add, modification, suppression) concerning mint mark, comments and mintage will generate an automatic modification request. This request will be processed as soon as possible and will be visible only after validation. It will appear in "The catalog - Change requests". The description of the coin is not verified. Any member can modify it. The coin page is partly verified - Only descriptive information (weight, alloy, description, pictures...) have been controlled by a team member. Any modification (add, modification, suppression) concerning weight, alloy, description, pictures... will generate an automatic modification request. This request will be processed as soon as possible and will be visible only after validation. It will appear in "The catalog - Change requests". Information about the years are not verified. Any member can modify it. The coin page is totally verified - The Numista team controlled all information about the years and description. However, this coin is still in circulation and a member can add a year after to the one on the page. On the other hand, it's impossible to add a year before the last one on the page. To add a year before the last one on the page, it's mandatory to make a request on the forum "Numista catalog" with a link to the concerned coin page. Only a team member can modify the list of the years. Any modification concerning mint mark and mintage will generate an automatic modification request. This request will be processed as soon as possible and will be visible only after validation. It will appear in "The catalog - Change requests". The coin page is totally verified - The Numista team controlled descriptive information and the years. Any modification concerning descriptive information, mint mark, mintage and comments will generate an automatic modification request. This request will be processed as soon as possible and will be visible only after validation. It will appear in "The catalog - Change requests". To modify the year list, it's mandatory to make a request on the forum "Numista catalog" with a link to the concerned coin page. Only a team member can modify the list of the years. NOTE: Verified in the English catalog or in the French one or in both of them? 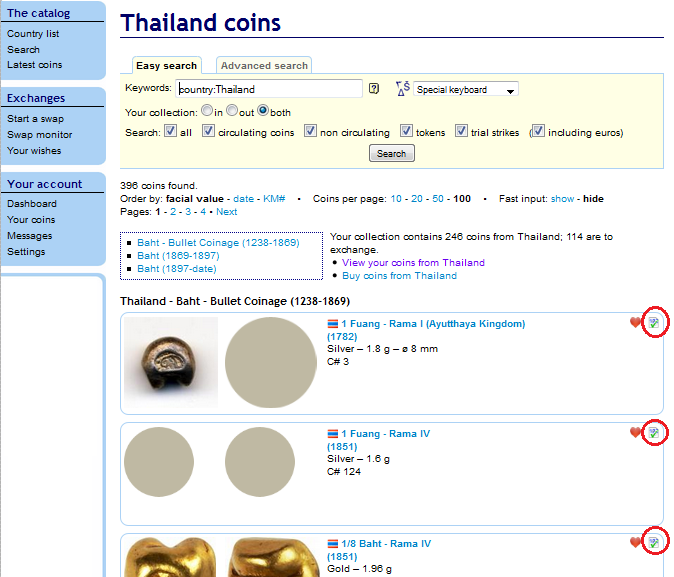 The verified status of a coin page is not necessarily the same in the English and French catalog. When descriptive information has been validated in one language, the common information (numerical data such as years, weight...) are validated in the other language (thus any modification of these data will generate an automatic modification request even if the icons or are not shown). To swap to the other catalog, just click on the flag on the top of the screen or . Some information is available in only one language. It's then always useful to switch to the other catalog. shows that you have at least one year of this coin in your collection. shows that you have all the years reported on the page of this coin in your collection. shows that you don't own this coin. shows that you own this coin, but not this year.